Hands down, the best thing I can make is popcorn. At first, I thought that was a little sad, but I’m ok with it. I instantly know what my best dish is. Quick: can you name yours in the next three seconds? GO. Bet you couldn’t. Or I bet you have so many winners that you just couldn’t narrow it down. Well played. When I did study abroad in Germany, I missed many familiar flavors. Popcorn was one of them. Alas, I could find no microwave bags of popcorn. What could I do??? Eventually, I noticed that they do have loose kernels. Like for campfires. Or pilgrims. Or something. But I remembered that one friend I had in middle school whose mom made us popcorn ON THE STOVE. I was so intrigued by this that I made a point to watch her. So I gave it a go. And I’ve never gone back. 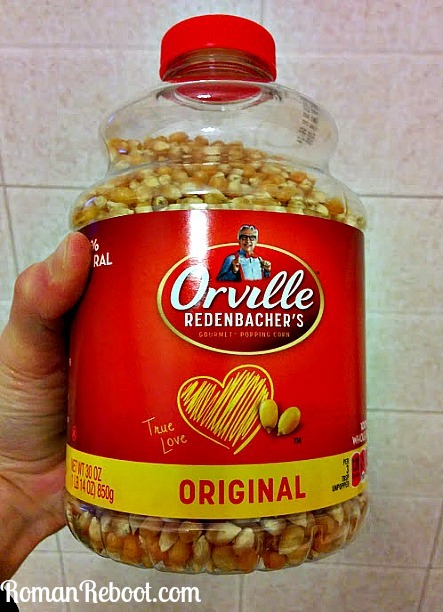 #stovetopforlife Please keep reading if you would like to ruin any other popcorn experiences in your life and create a snack that is not at all good to have around the house with toddlers. Next up, select a popcorn pot. Mine is the smallest size from my Revere Ware set. Which I think is from college. Nice. Be prepared for this pot to possibly get a little charred. Mine is pretty much a dedicated popcorn pot which may or may not get completely cleaned in between every use. (I make a lot of popcorn.) Wow, this is pretty much the grossest tutorial ever. 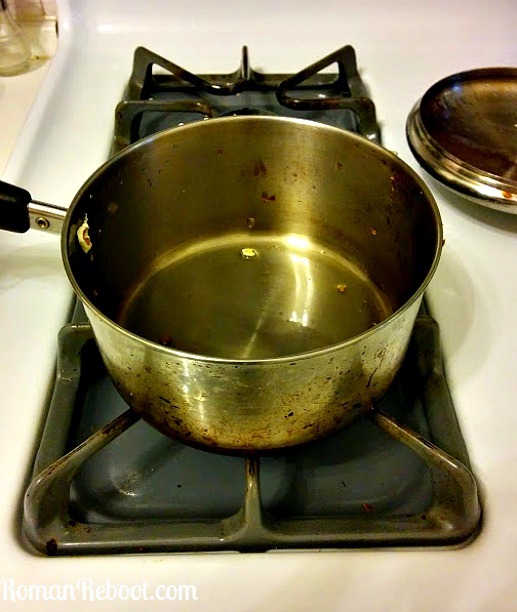 How hard would it have been for me to swipe a paper towel around the pot? But if that is too much, you know I’m not going to go back and reshoot these pics. Pinterest this is not. Next, get your olive oil. I like Extra Virgin Olive Oil. I don’t add any butter at the end, and you can really taste that EVOO goodness in every bite. 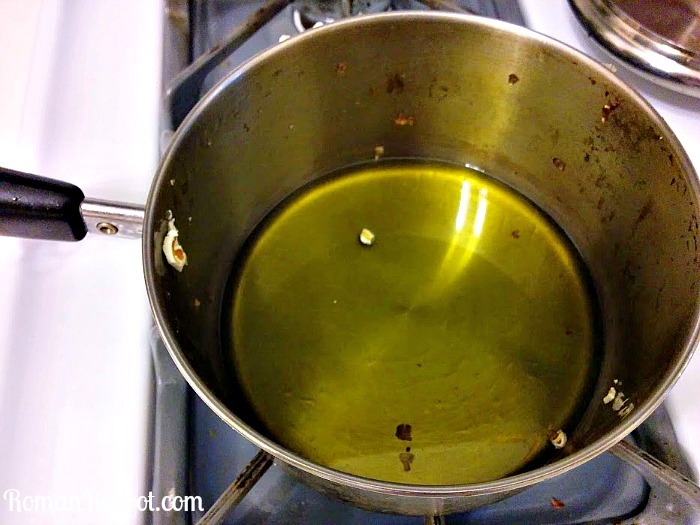 Pour the oil to cover the bottom of the pot. Then pour some more. And then probably a little more for good measure. James swears he does exactly what I do when he makes popcorn, but his is undeniably not as good. I think this is the critical difference. You want at least a finger of oil in there. Turn on your burner low to medium heat. Mine has a dial that goes to ten; I set it at four. I took a picture of this, but if you thought the pot picture is gross, you really do not want to see that one. Clean my oven. I’m on it. 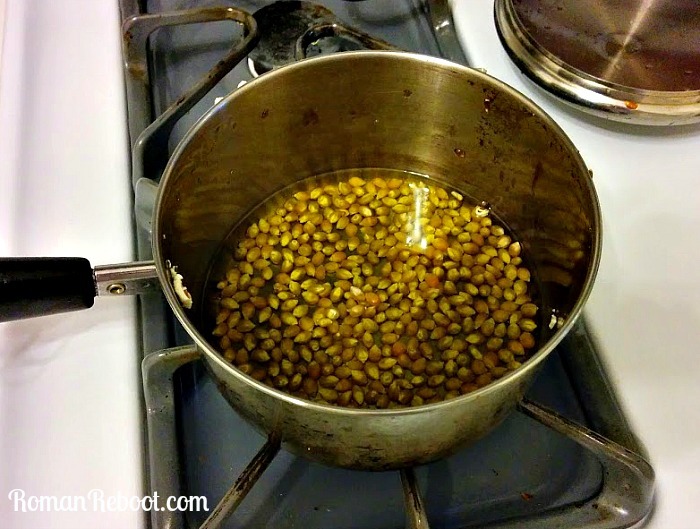 Then, add your kernels. (Heh, kernels.) I try to aim for a single layer covering the bottom. 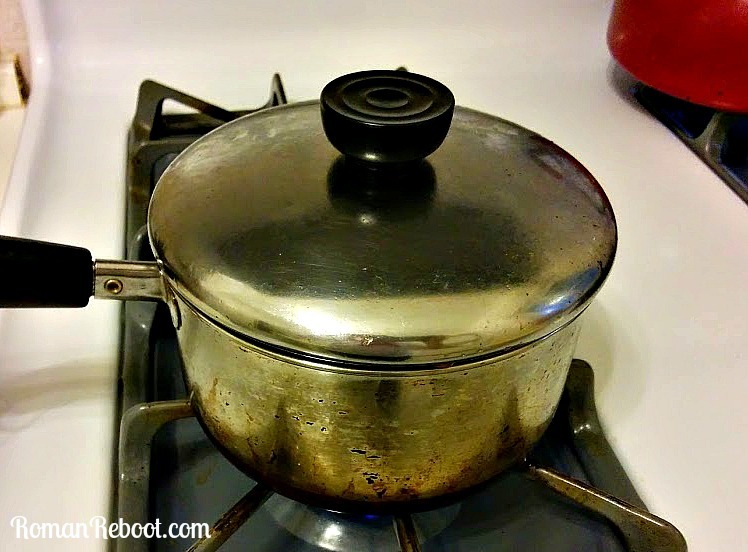 Put the lid on the pot. You would think this would be obvious, but you’d be surprised . . .
Now you listen for those little beauties to pop. Alton Brown recommends shaking the entire time, but I usually only do a shake or two. For me, being done is less about waiting for the kernels to die down and more about seeing when they lift the lid. But that is just because of my familiarity with my designated popcorn pot. Lid lifting coincides with near popping conclusion. Once they start to lift the lid, I remove from heat. I usually wait ten seconds after the last pop to pour them out. You never know when there will be a diva straggler. And now you salt. 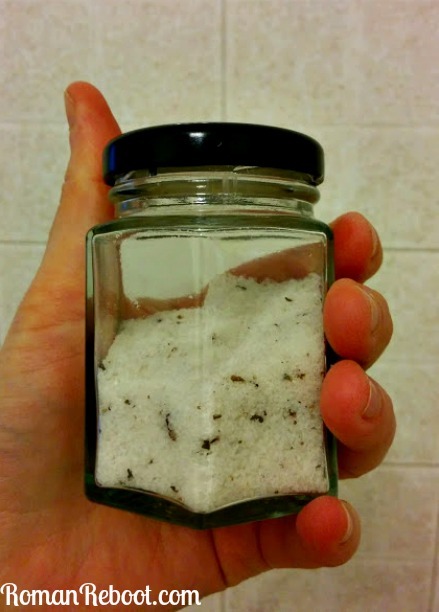 For added fanciness, I’ve been dabbling with fancy salts. Bourbon salt has paired well. Here is my truffle salt. Go wild! And then, ta da! You have a bowl of perfectly popped goodness. 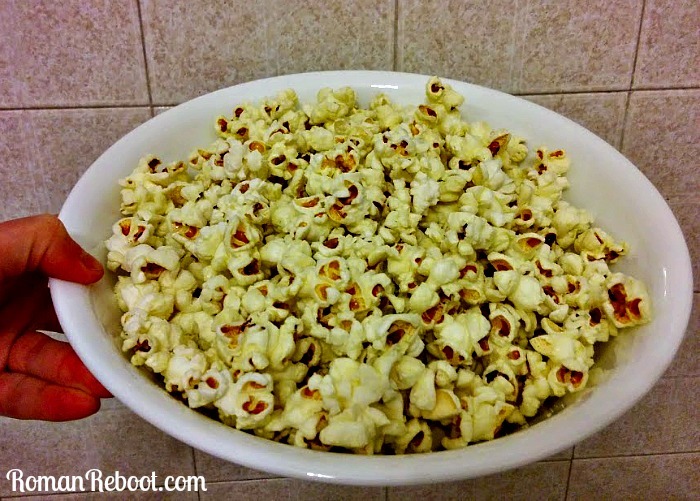 I think popcorn is especially great for the holidays and for cold weather. Again, sadly, not a great snack for young kids. *Alas, I can offer you no salt removal tips. If you shake it, it may sift more to the bottom? You can’t expect this sort of kitchen magic from someone who can’t be bothered to fully clean a pot before taking pictures to put on the internets. Do you stove top? Any popcorn tips? What’s your best dish? Melissa, how I miss you. It’s been way too long since I’ve been in touch. I’m so glad I finally sat down to catch up on your new life in Rome. 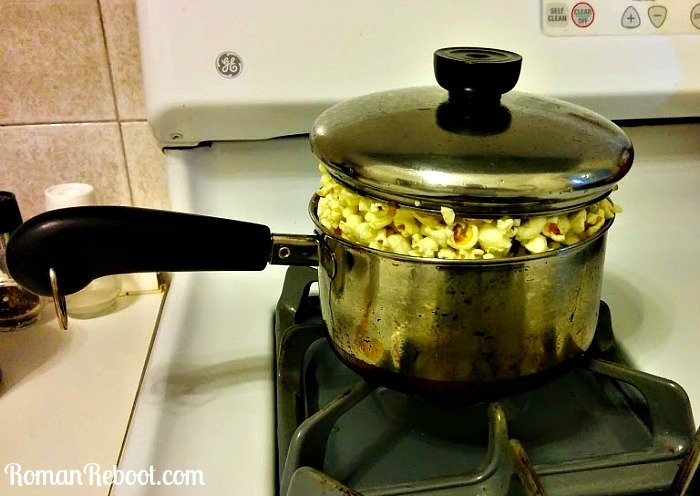 We also pop our popcorn on the stove top. I use EVOO for the popping, but i always add ridiculous amounts of butter at the end. And lately we’ve been adding onion powder and dried chives that we grew in the garden this summer–YUM! Oh! And sometimes Pen opens a box of mac and cheese and eats only the dry pasta, so when she does this, I also have cheese powder to sprinkle on my popcorn, which is amazing!